THE Papua New Guinea Hunters hierarchy have appealed for help from the Queensland Rugby League amid fears over the expansion club’s financial future in the Intrust Super Cup. 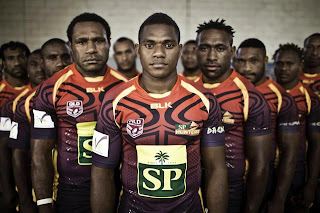 On the eve of PNG’s clash with Northern Pride yesterday, Hunters interim chief executive Shane Morris dismissed speculation the club is facing bankruptcy just 12 months after a superb debut last season. But Morris told The Sunday Mail PNG must do “the little things right” and “make sure we are looked after” to ensure the Hunters have a viable, long-term future in the ISC. Morris attended a monthly CEO’s conference last month in Brisbane, where he expressed PNG’s desire to receive aid, possibly from the Queensland government. The Hunters have been a smash hit with Queensland league fans, but the cost of competing is challenging, with the fledgling outfit required to cover travel costs to PNG for all teams. “We have to make sure we keep going. We’re planning to be here for the long run but we have to do the little things right,” Morris said.